FAIRFIELD — There’s more to this world than meets the eye, especially for those who have lived their entire lives in southwestern Connecticut. That’s the message Fairfield Ludlowe High School students gained from the annual International Day last Friday. Dozens of presenters from a range of fields spoke to classes throughout the school day, sharing the good and not-so-good realities of life in other nations. Topics ranged from serious issues like human trafficking to simple personal accounts of experiences abroad, such as that shared by a former Peace Corps volunteer and 2009 Ludlowe graduate, who talked about life and customs in Senegal. 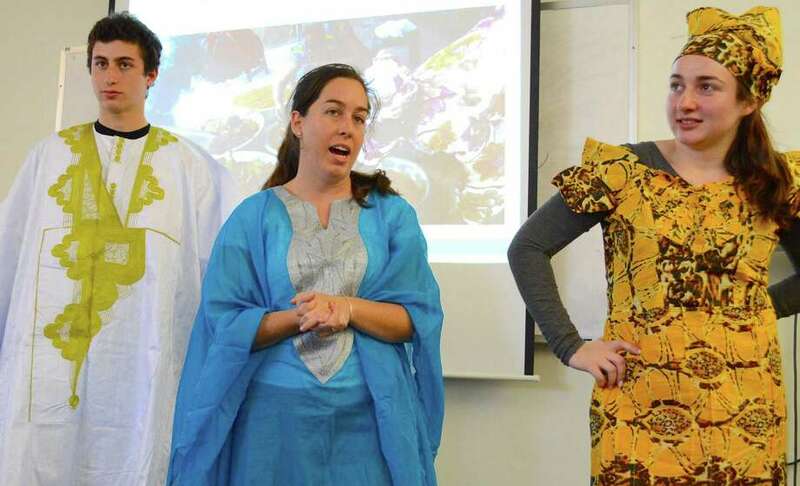 “It’s incredibly inappropriate to greet someone socially with your left hand,” said Jessica Wolff, who brought African clothes for the students to see and try on. One teacher, Bob Benjamin, related his experiences working with a bank in Germany — he was unaware workers there end their days strictly at 5 p.m. and are not used to being asked to stay late. “In the U.S. people work around the clock,” he said, noting how important it is to be aware of differences when living in other cultures. “Our goal is to get you to think beyond your everyday stuff here and get you to concentrate on the world beyond,” said teacher Carol Samuelson, who helped to organize International Day at Ludlowe nine years ago after having been part of a similar program earlier at cross-town Fairfield Warde High School. “I believe education is the way to change our world,” said Samuelson, who devoted several class periods to discussing her experiences traveling in both Panama and Rwanda, and getting involved with civic projects there. “I feel like the whole teenage culture, we’re egotistical and self-centered and stuff, but you get see … how you can make a difference … how you can change the world,” she added.